Rubén Flores (PhD, University of Kent, 2009) is a visiting lecturer at University College Dublin and a visiting scholar at Maynooth University, Ireland. He was also, until recently, an assistant professor at the Higher School of Economics (HSE) in Moscow. His research focuses on the sociology of care and compassion, and on the dialogue between Buddhism and sociology. His most recent publications include “Routes into activism in post-Soviet Russia: habitus, homology, hysteresis” (with Aleh Ivanou, Social Movement Studies, 2018), and “The changing place of care and compassion within the English NHS: an Eliasean perspective” (with Patrick Brown, Social Theory and Health, 2017). Rubén Flores (PhD, University of Kent, 2009) es investigador visitante en University College Dublin y en Maynooth University, Irlanda. Hasta hace poco se desempeñó como profesor asistente en la Higher School of Economics en Moscú. Su investigación se centra en la sociología de los cuidados y de la compasión, así como en el diálogo entre el budismo y la sociología. Entre sus publicaciones más recientes se cuentan “Routes into activism in post-Soviet Russia: habitus, homology, hysteresis” (en colaboración con Aleh Ivanou, Social Movement Studies, 2018), y “The changing place of care and compassion within the English NHS: an Eliasean perspective” (en colaboración con Patrick Brown, Social Theory and Health, 2017). 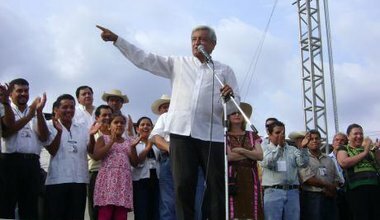 Apropos of AMLO: It's time to leave behind the term "populism"